Picture this: you have just completed an invigorating but stabilizing yoga class, you are resting now in savasana, your body relaxed and your heart open. Your mind, once racing, is now focused on the calm of the room and the joy of having made it through another session on your mat. For a while, all your problems seem miles away. This is a common experience for many people who turn to yoga for holistic rejuvenation. Yoga is an amazing practice that has a broad effect on us, healing both our bodies and minds. For some of us, our inner worlds needs a little extra help to stay calm and relaxed and yoga provides that added support. Anxiety is a common issue that effects millions of people every day. We have all experienced some form of anxiety or nervousness in our lives, but for some it becomes a daily occurrence that greatly impacts quality of life. The good news, however, is that yoga is a reliable resource that anyone can use to help reduce and manage their anxiety. Regular practice can help to develop healthy thought patterns and reduce the frequency and intensity of anxiety. Yoga can even be used in the moment to help diminish anxiety on the spot. Here are 10 helpful yoga poses to conquer your mind and control your anxiety. The breath is a powerful thing. We often speak of the breath and syncing up our breathing patterns with our physical movements. But the breath can be used alone to help lessen the effects of anxiety. Research has shown that breathing techniques actually change the brain’s function and can help return our nervous system to a state of peace. One particular method that many people find useful is Alternate Nostril Breathing. First, sit or stand comfortably with your back straight and shoulders related. With your right hand, place the tip of your index finger and middle finger on your forehead. The little finger and ring finger will rest on the left nostril and your thumb will rest on the right nostril. Gently press your thumb to your right nostril and breathe out through the left nostril. Breathe in through the left nostril, then press it closed and release the right nostril to breathe out through it. Again, breathe in through the right, close, then exhale through the left. Repeat this cycle of inhaling and exhaling while alternating the nostrils for several rounds.This is best practiced with your eyes closed and deep, smooth, replaced breaths. After a few rounds you should feel your body and brain begin to relax. Alternative Nostril Breath and other pranayama techniques are extremely helpful not only in reducing anxiety, but also for releasing stress, harmonizing the brain, focusing the mind, and improving respiration and circulation. We know Cat-Cow provides an amazing stretch for the spine, neck, and hips. But this flowing, releasing pose can also help to relieve anxiety and help you move through life with a little more flexibility. Cat-Cow helps to synchronize your breath, improve your focus, stimulate your life-force energy, stabilize emotions, and release generalized tension in the body. This leads to a healthier nervous system and a calmer mental space. Rest on your knees, hip width apart, and place palms firmly on the ground, underneath your shoulders to come to a tabletop position. Exhale slowly and fully, and roll your back to the sky, tuck your chin to your chest to come to cat. Inhale slowly and arch your back, bringing your navel to the ground, lift the head high to look at the sky. Repeat Cat-Cow several times. Upward Dog, or even Cobra pose, can help to open your heart, release tension or restriction in the chest, and elevate your mood. This is the perfect remedy for stopping anxiety in the moment and preventing it down the road. Keeping the chest and Heart Chakra open will improve both the physical and mental symptoms of anxiety and keep you cool, calm, and collected. Start by lying face down on the floor, legs stretched back with the tops of the feet resting on the ground. Place your palms alongside your waist with elbows bent. On an inhale, straighten your elbows and guide your head and chest upwards. Draw your shoulder blades back and open your chest. Keep your buttocks and thighs firm and engaged. Hold for 15-30 seconds, then release and slowly lower on the exhale. Thread the Needle is the perfect pose to practice every morning to unblock tension in the back. This also helps to release the shoulders (where many of us store our stress and anxious energy) and open the chest. It also promotes flexibility and ease. Start on all fours, in a tabletop position with your arms underneath your shoulders. Lift the right arm and slid it under your left arm, as though you were threading a needle. Turn your head to the left and rest it, your right arm and shoulder on the ground. Stay here for a few breath cycles, then draw the arm back up to tabletop position. Repeat on the left side. Pigeon, while a simple pose, provides a physical release and stable position to help ease anxiety. As mentioned before, our shoulders and chest can hold tension and past trauma or emotions. The same goes for our hips. Pigeon helps to stretch and open the hips so we can work through and release these old emotions. Pairing this pose with very intentional breathing will make this a power pose for reducing anxiety. Begin on the ground on all fours, then slide the right leg towards your head. The right knee should reach the right wrist, then the leg can bend so that the right foot reaches the left wrist. Move the left leg back behind you keeping your leg internally rotated and relaxed. You may either stay upright here or gently lower yourself to rest on your forearms. Place hands in prayer position and rest your forehead on your thumbs. Rest here for several breaths or as long as is comfortable. Repeat on the opposite side. Sometimes we all need a new perspective to shift our mindset. There’s no better way to achieve that then spending a few minutes in a yogi headstand! Headstands not only help to flush blood to the brain and improve focus, but also cleanse our adrenal glands and release our stress. Come to a tabletop position, then lower to your forearms. Create a support for your head by interlacing your fingers and resting them at the crown of your head. With your hips pointing to the sky, start walking your feet up towards your head and shift more and more weight on to your forearms and shoulders. Gently lift one leg and stabilize into an L-shape. As you are comfortable, raise your other leg or try different leg orientations. Rest here for a few breaths or as long as is comfortable. Return to the mat slowly and judiciously. Similarly to the headstand, Camel can help you release your thoughts and find a new perspective. This is often helpful when you feel your anxiety takes over and controls your mind. Camel is also an amazing pose for anxiety because of it’s ability to really open and release the chest and Heart and Throat Chakra, allowing for a release in the tightness or nausea that often accompanies anxiety. Begin by kneeling on your knees on the floor, with legs and hips perpendicular to the ground. Press your shins and tops of the feet to the floor while keeping your thighs and hips soft. Rest your palms on the back of your pelvis with fingers pointing down along your buttocks. Inhale and open your chest, press shoulder blades together and lean backwards. If you are able to, drop your hands one at a time to grab on to your ankles or feet. Feel the stretch and strengthening of your back muscles. Keep your neck neutral. Rest here for 15-30 seconds. Bring your hands to your front pelvic bones and gently draw yourself forward to an upright position. Fish pose is another chest-opener. The difference with fish pose to the other chest-openers is that it also allows you to comfortably lay on the floor for more relaxation. 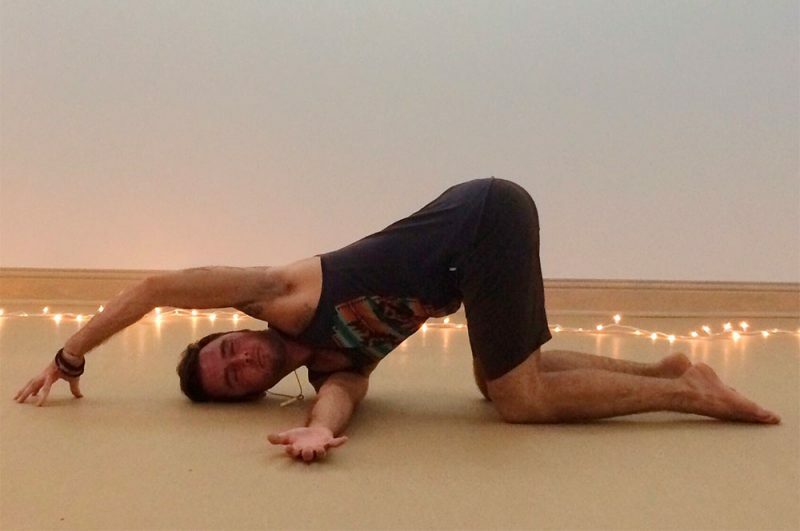 Fish pose is a great preventative pose to do at night before bed. It calms the mind, releases built-up tension in upper body, and promotes healthy breathing. Start by lying on the floor, face up. Bend the knees and place your feet on the ground, or leave your legs pressed to the floor. Lift your pelvis and slide your hands to rest underneath your buttocks with palms down. Keep your arms resting close to your torso. Inhale, pressing your forearms to the floor and lifting the chest and head and arching your back. If you are able, rest the back or crown of your head on the ground to fully open the chest. Make sure to not crunch the neck here. Rest for 20-30 seconds while continuing slow controlled breaths. On an exhale, release back down to the floor. Repeat 2-3 times. Need a minute to calm down? Find a private space and get into Legs Up the Wall pose. This pose helps to turn off the fight or flight response that increased stress or anxiety can cause in the body. It nearly immediately reduces anxiety and helps to relax the mind. Legs up the wall pose can also be done at night, before bed, to keep anxious thoughts from interrupting our sleep. Sit on the floor near a wall and swing your legs up to land on the wall ahead of you. Move your buttocks to the wall so that you are as close to it as possible and lay back so your back is resting on the floor. Extend your legs up the wall either straight above or in a relaxed ‘V’ position. Allow your arms to rest by your sides with palms facing upwards, or rest them on your lower abdomen. Rest here for about five minutes. It’s no surprise that Corpse pose is great for managing anxiety – it is well-known for its calming and meditative effects. But you don’t have to save Corpse for the end of a yoga session; take a few minutes to rest and recharge anytime of day. Yoga can be a life changer in many ways; it is transformational, empowering, and promotes healthy lifestyles and habits. Yoga also has the power to heal the mind and relieve our suffering. In the case of anxiety, yoga provides us physical relief, mental relaxation, and the power to control our own minds. Customize your yoga practice to help you champion through anxiety. Stay in these poses longer for bigger benefits, or strategically choose the best time of day to practice to help you intercept anxiety. If you suffer from anxiety or panic attacks, adopting a regular yoga practice will not only give you a few handy tricks for times of need, but will also help you manage and reduce your anxiety in general.